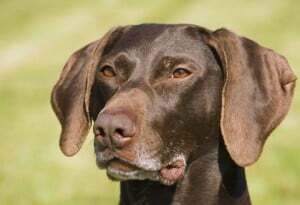 The attractive and intelligent German Shorthaired Pointer was, as the name suggests, first developed in Germany to point out game, and then bring it back to his owner when it was shot. They are active and cheerful, and they make delightful canine companions. German Shorthaired Pointers (sometimes known as GSPs) are handsome gun dogs that thrive when they have a job to do. The German Shorthaired Pointer’s strong working drive makes him unsuitable as a house pet for many households. He needs a lot more exercise than most other breeds. He is also an independent thinker because he needed at times to work independently of his owner. If he doesn't get the opportunity to run every day, and if he doesn't have regular obedience training, you will notice problems start to develop with your GSP’s temperament. Their short coat is easy to care for so if you don't want to spend more time on your dog's hair than you do on your own, this will really appeal to you. With just one glance at the GSP, anyone can tell that this breed is a true canine athlete. These dogs are lean, muscular and intense. German Shorthaired Pointers make excellent running companions. If you are an avid jogger, hiker or cycler, a GSP might be your perfect match. You need to be prepared to devote at least one hour per day to providing your German Shorthaired Pointer exercise. If you cannot devote that much time to their exercise needs, you will either need to consider a different breed or get very creative. Many GSP owners take their dogs to doggie daycare while they are at work. Romping with other dogs is great exercise! You get to pick up a tired pooch at the end of the day! You might need to hire a dog walker or a neighborhood teen to take your dog for extra exercise. If you are devoted to this breed, but you cannot keep up with the needs of a young dog, consider adopting an adult or senior GSP! There are many older dogs that need homes. If your GSP lacks exercise, it will lead to him being frustrated and restless. This is when he is likely to become destructive. He may also decide to exercise himself, and he can easily jump 6 foot high fences and go for a walk. Your local animal control officer may pick him up for straying, or he may be hit by a car. Such an active dog temperament needs an active owner. This is not the breed for you if you don't like to go hiking or jogging on a regular basis. If possible, look for retrieving clubs and let your dog get involved in the hunt. This is the best way to not only let him use his brain, but to tire him out physically. I have seen German Shorthaired Pointers be very successful in obedience and agility competitions. They are quick to learn and their natural speed and agility allow them to complete the obstacle course quickly and accurately. Other activities include Nosework, Search and Rescue, Dock Diving, Field Trials, and Flyball. The GSP makes a fierce competitor! The German Shorthaired Pointer temperament is such that he will form a very strong bond with his owner, and these sports will reinforce that bond. Many hunting dog temperaments aren't compatible with small pets, and this can be the case with the German Shorthaired Pointer. He has a very strong instinct to hunt and chase and can make life miserable for your pet cat or rabbit. While he can learn to live in harmony with other pets, you can't be complacent. Always keep an eye on your GSP when he is the company of small fluffy animals. This hunting instinct can also come to the fore if your dog takes himself for a walk. He may bring home trophies such as dead birds, rats, and cats. The best way to manage this is to give your German Shorthaired Pointer plenty of exercises and to keep him secure behind high enough fences. Never let your GSP off the leash unless you are in a safe area. The German Shorthaired Pointer temperament makes them one of the cleverest members of the dog world. If they feel understimulated, they will get into mischief. This will make them appear to be willful and disobedient, but this is not the case. They are just bored, and the need more training and guidance from you. This dog naturally has an independent streak because when he hunts with his owner, there are times when he has to work out of sight, and figure things out for himself. This can make training tricky. You will need to be smart and creative to keep your GSP motivated to follow your commands. Should you decide to welcome a GSP into your family, you will have to be prepared to invest time and effort into training him. If possible, sign up for an obedience class when your dog is still young. A professional trainer can give you guidance on training this breed. Make sure to find a trainer that uses positive, force-free methods. Avoid trainers that use harsh punishments or painful tools such as choke chains, pinch collars or shock collars. Positive reinforcement training is the most effective method, and it will strengthen the bond between you and your dog. Remember that training is a lifelong commitment. Dogs learn throughout their lives, so you will need to continue working with your GSP throughout your life together. For help with training your GSP take a look at The Online Dog Trainer by Doggy Dan. Doggy Dan is an expert Dog Trainer based in New Zealand. His online resource contains Hundreds of Excellent Dog Training Videos that will take you step-by-step through the process of developing a healthy, happy well-behaved dog. The German Shorthaired Pointer originated in Germany in the 1800s. The breed is an all-around pointing and hunting dog. The GSP can be trained to hunt many different types of game. They are excellent swimmers, so they can be used on land or in the water. The German Shorthaired Pointer is a medium-sized, slender hunting dog. The average German Shorthaired Pointer weight is between 45 and 70 lbs. The average German Shorthaired Pointer height is between 21 and 25 inches. German Shorthaired Pointer colors are very distinctive. The coat may be solid liver, liver roan, or a combination of liver and white (such as patches or ticking). No other colors are acceptable according to the breed standard. The GSP is a low-maintenance breed in terms of grooming. The sleek coat requires little upkeep. Occasional bathing and brushing will be enough. Professional grooming is rarely necessary. The German Shorthaired Pointer’s fur does shed, although it is manageable compared to longer haired dogs. However, the fur is not hypoallergenic, so it is not the best breed for those who suffer from allergies. Establish a relationship with a veterinarian right away. Bring your dog to the vet at least once per year for an annual exam and vaccinations. It is crucial for your German Shorthaired Pointer to stay up to date on flea, heartworm and tick prevention at all times. It is also important to get your GSP spayed or neutered at the appropriate age. This is recommended for health reasons, behavioral reasons, and to prevent adding to the pet overpopulation problem in this country. With excellent care, the average German Shorthaired Pointer lifespan is 10 to 12 years. Note: if you agree that your health and your dog's health should be a top priority then get a copy of The Ultimate Guide to Dog Health. Your GSP friend will love you for it. This guide will help save you money, time and most of all help you keep your dog healthy. 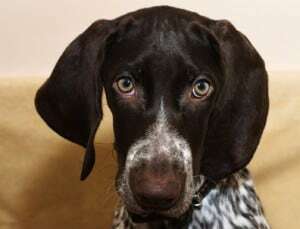 If you would like to make a German Shorthaired Pointer part of your family, please check out adoption and rescue options first. There are a lot of very friendly German Shorthaired Pointers out there looking for new homes. Sadly, many people acquire this breed without being fully prepared for their exercise needs. Therefore, many GSPs end up in shelters and rescue groups when their owners realize that they cannot keep up with the German Shorthaired Pointer activity level. Other GSPs end up in rescue because their owners go through personal crises such as divorce, financial hardship, moving, eviction, etc. A great place to start your search is through the National German Shorthaired Pointer Rescue Association. You can also use Facebook and Google to search for German Shorthaired Pointer rescue groups near you. You may want to expand your search to Pointer Rescues or even Sporting Dog Rescues. urther, you can also search for adoptable pointers on Petfinder.com, Adoptapet.com, and Getyourpet.com. These national adoption websites will allow you to set an alert and receive an email anytime a GSP becomes available for adoption in your area. Also, make sure to visit your local animal shelter or humane society. Ask to fill out an application so you can receive a call in the future when GSPs become available. If you adopt through a rescue group or animal shelter, your adoption fee will probably be somewhere between $75 and $300 depending on the organization. Almost all adopted GSPs will come already spayed/neutered, vaccinated and vetted. If you choose to purchase a German Shorthaired Pointer puppy from a breeder, do your research to make sure you find a high-quality, ethical German Shorthaired Pointer breeder. A good place to start your search is through the German Shorthaired Pointer Club of America. The GSPCA maintains a list of German Shorthaired Breeders throughout the United States that have agreed to adhere to the breeder’s code of ethics. It is up to the buyer to do their research to make sure that the breeder is humane and reputable. Never purchase German Shorthaired Pointer puppies (or any puppies) over the internet or from pet stores. These puppies are very likely from puppy mills or backyard breeders. Puppy mills are breeding operations that breed puppies for profit with very little concern for their health or temperament. They also often house the breeding animals in inhumane conditions. Puppies that come from puppy mills are often sick and/or riddled with temperament problems. Always make an appointment to visit the breeder in person to assess the property. Make sure the breeding dogs appear to be in good health and have solid temperaments. Ask to see medical records and results of genetic testing. Talk about the purchase agreement and health guarantee for the puppy. A good breeder will ask you to return the puppy to them if things do not work out for any reason. A responsible breeder will have questions for you as well. They want to make sure that their puppies go to excellent homes. If the breeder does not want you to visit the premises and does not ask you questions or ask you to sign a contract, these are red flags. Keep looking for alternatives. When you purchase a GSP through a high-quality breeder, the German Shorthaired Pointer price will be between $800 and $1200. Certain bloodlines can be over $5000 per puppy. Do not let the German Shorthaired Pointer temperament make life difficult for you. Before you choose your breed, consider your lifestyle and how much time and effort you can put into training, grooming and exercising your dog. This particular breed is best suited to very active people, and if you can't keep up with your GSP, you can expect barking, destructive behavior, and hyperactivity. The German Shorthaired Pointer temperament is a pleasure to live with, for the right owner. Next post: How to Best Manage the Greyhound Temperament? Previous post: Can You Live with the Bernese Mountain Dog Temperament and Personality?